Why? Because hip-hop is art. And poetry. And music. And rhetoric. Because hip-hop is political science. And cultural anthropology. And linguistic anthropology. And philosophy. Because hip-hop is business. Big business. Because hip-hop is oral tradition. And zeitgeist. Because hip-hop is life. And death. And, for some, even salvation. The hip-hop industry generates $10 billion a year, and its reach extends far beyond music. 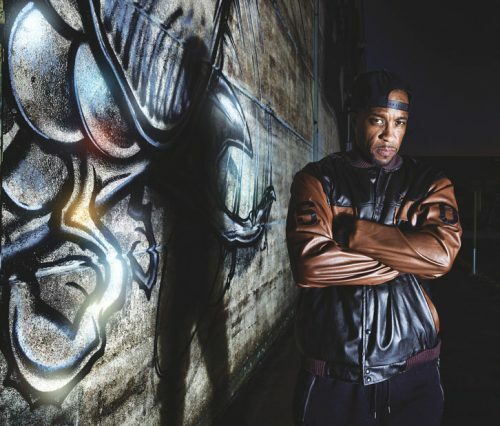 Hip-hop is a culture with a language and symbols (think graffiti art) and an aesthetic. There are norms and values. There is a mythology and a reality—with the requisite heroes and villains. And increasingly there is recognition of its contributions by the cultural elite. This year, the Smithsonian will release the Smithsonian Anthology of Hip-Hop and Rap, comprising nine CDs with 120 tracks and a 300-page book of essays and photographs. In July, the Kennedy Center announced that it would award a special prize to the Tony, Pulitzer, and Grammy award-winning hip-hop musical, Hamilton. Last April, hip-hop artist Kendrick Lamar won the 2017 Pulitzer Prize for music, the first nonclassical or jazz musician to receive the award. Also in 2017, a single painting by graffiti artist Jean-Michel Basquiat sold for $110.5 million at auction. At URI, faculty are introducing critical study of hip-hop to their students through the lenses of philosophy and art. 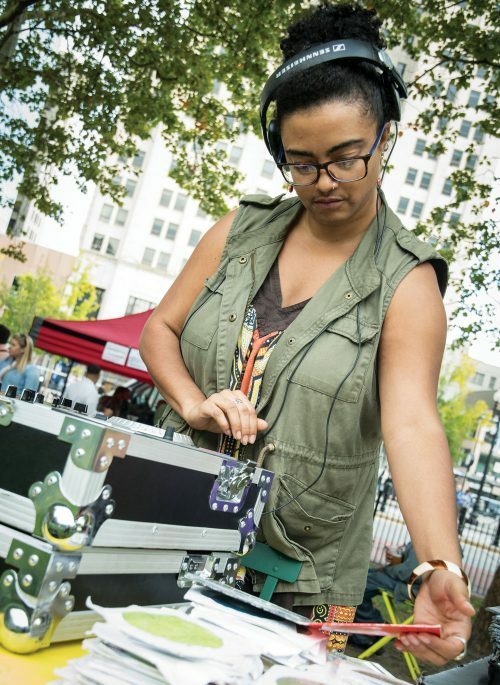 Alumni are making careers in the field, and students like Lacy are finding ways to integrate their love of hip-hop culture into their educations. Because hip-hop matters, says MC and entrepreneur Theo Martins Jr. ’09. “It’s the driving force of innovation and ideas in popular culture. Hip-hop is solely based on being the first and the freshest, the ‘here’s what’s hot,’ and when you have that as the driving force for your ideology, you are in a constant state of discovery, looking and looking. 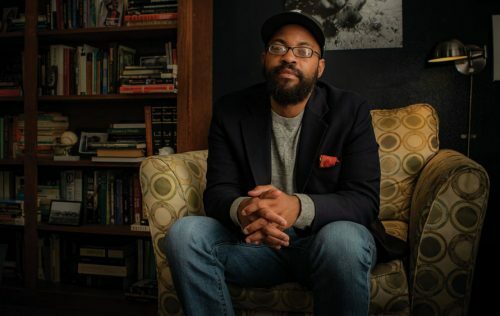 James Haile III, assistant professor of philosophy, uses hip-hip to convey weighty ideas—such as the destruction of thought and the nature of being—to his under-graduate philosophy students. James Haile III, assistant professor of philosophy, has a lot of research interests: continental philosophy (especially aesthetics), philosophy of literature, philosophy of place, Africana philosophy and philosophy of race, the intersection of 20th century American and African-American literature and existentialism, writers Richard Wright, Ralph Ellison, James Baldwin, and Jean-Paul Sartre, black aesthetics, and especially the contemporary genre aesthetics of hip-hop. Oh, and Kendrick Lamar. What artists like Lamar and graffiti artist Basquiat are doing, Haile says, is blowing up an idea and creating from the fragments. Kendrick Lamar takes the West Coast narrative and gives you those elements in different pieces. It sounds chaotic,” Haile says, likening Lamar to Miles Davis. So, how does a philosophy professor use popular music to convey such weighty ideas as the destruction of thought or the nature of being to 18-year-olds? He meets them where they live. He talks about the title track of good kid, m.A.A.d city: “Sing about me.” He notes that Lamar alters his voice to tell others’ stories in their voices, creating a conversation in which he channels all parts. So to study Lamar is to contemplate the very nature of identity? Hip-hop artists so revere words that they profane them. They add and subtract letters from them at will. They stretch and pull them like gum wound round the finger. They take two words and mash them together. They take one word and split it like an atom. And the fallout is music—and more: insight into the human condition, the outpouring of a soul expressing love, lust, anger, frustration, hatred, unity, pride, virtue, and vice: it’s all there. Hip-hop has been criticized for its misogyny, homophobia, racist language, and glorification of violence. But is it so different from any other art form? Hasn’t the artist always sought to mirror back to society its triumphs and its failures? Hasn’t art always been about giving voice to thought? Africa Costarica Smith is a poet and spoken-word artist. “Hip-hop and rap give people a chance to tell their story,” she says. Smith, who competed in slam poetry contests at URI, says the allure of rap and hip-hop is its accessibility. Still true to its urban roots, hip-hop is narrative in the tradition of the epic poem, speaking to universal truths, meant for mass consumption. This is the language of youth speaking their truth. As an undergraduate, Smith sometimes found herself the only nonwhite person in a classroom. Writing and performing proved a release from the unease she sometimes felt. “Poetry helps me put it all into perspective. Then I can reflect and feel better about things. In the black community, we don’t talk about mental health. 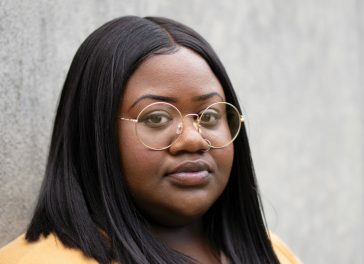 Rap and poetry address personal and societal issues,” she says. Art as activism plays well on the grand canvases Dilworth creates using acrylics and spray paint, Sharpie markers and fabric. It’s an involved process. 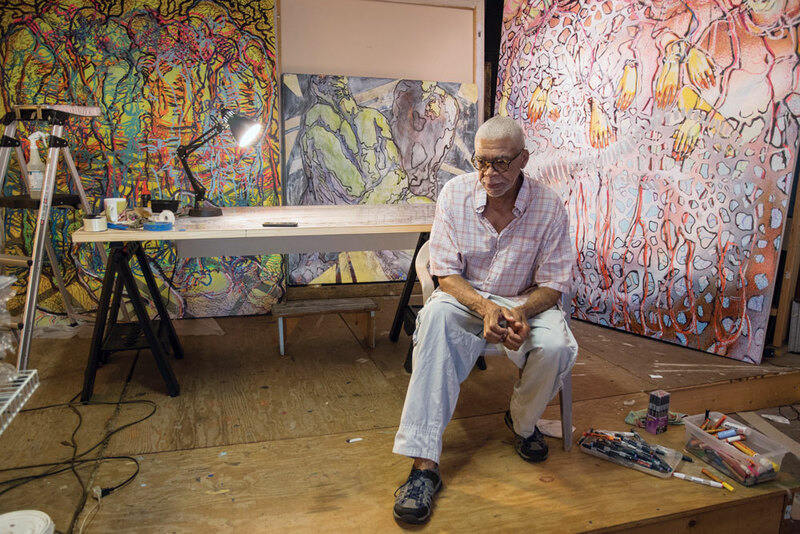 Dilworth photographs and interviews the subjects of his paintings. Then he makes stencils on grids that are reproduced on the canvases. Square by square, his drawing grows until figures tower and a stepladder is needed. While his is not graffiti art, per se, Dilworth’s paintings echo the energy, movement, and emotion of graffiti art. Standing in front of a painting in its infancy—several life-sized female figures in black outline rendered over Montana Gold acrylic paint—Dilworth ruminates on art’s provocative nature. URI alums and rappers Duval “Masta Ace” Clear ’88 and Sage Francis ’99 stepped into the world of hip-hop after graduation. Both recommend that path, in that order. Rapper Duval “Masta Ace” Clear has been making music his way for 30 years. His longevity, artistry, and influence have made him a legend with fans and other artists. Thirty-year hip-hop veteran Masta Ace offers similar advice. He counsels those who would follow his path to be equal parts artist and pragmatist. “I tell young people that all things are possible. Look within and find that strength, that drive, that desire—and go for it. But make sure music is not your plan A,” he says. “When I was starting out, one in 1,000 made it, got a deal, put a record out. Now, these kids are up against the world. The odds are much worse now. My marketing degree from URI was my plan A. Poet, essayist, and DJ Reza Clifton introduced URI to female rappers and musicians through the WRIU radio show Voices of Women. former WRIU DJ who introduced the campus to female rappers and musicians through the radio show Voices of Women. “The reason hip-hop will continue is because it still represents the voice and mood of the culture of the oppressed,” Clifton says. Hip-hop is a genre where you don’t need to have formal music training; you don’t have to be able to play the violin or the piano. Interesting feature article! Coincidentally, URI ‘14 Engineering Grad and Hockey Captain, Sean O’Neil just contributed to a hip hop album that just debuted #1 on Billboard. Sean’s guitar is featured in Metro Boomin’s, “No More” on the just released, All Heroes Don’t Wear Capes Album. Sean’s experiences and collaboration with Metro Boomin are a tremendous example of how people from very diverse backgrounds can come together and unify through Music. Sean’s younger brother Ryan, URI ‘21 is currently enrolled in the School of Engineering as well. Go Rams!